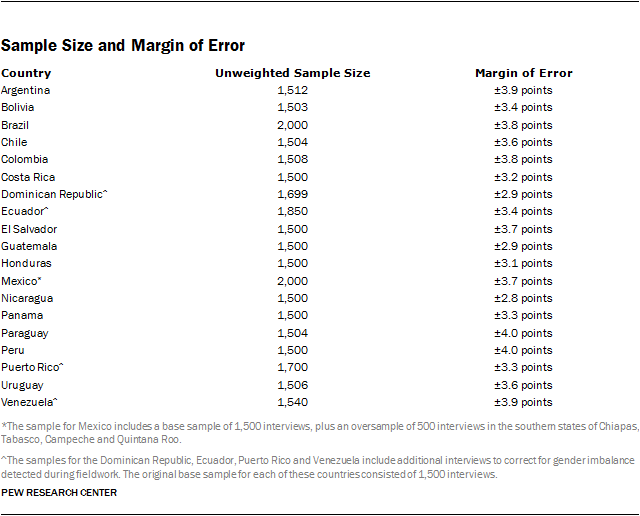 Most tables and charts in this report cite country-level findings. 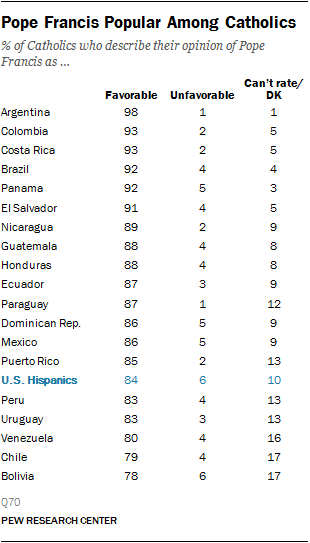 But on some questions, regional medians are reported to help readers see cross-national patterns. The median is the middle number in a list of numbers sorted in ascending or descending order. 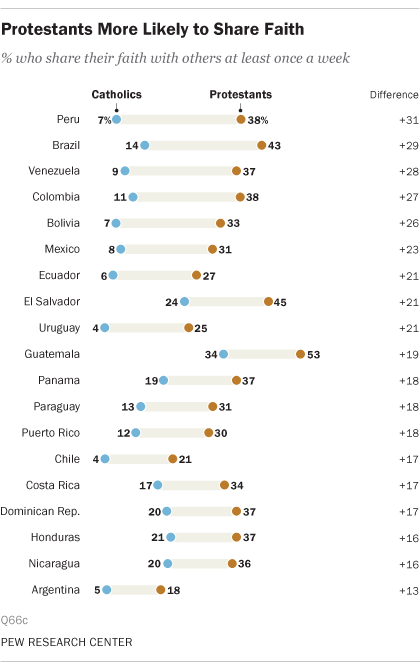 In a survey of 18 countries and Puerto Rico, the median result is 10th on a list of country-level findings ranked from highest to lowest. 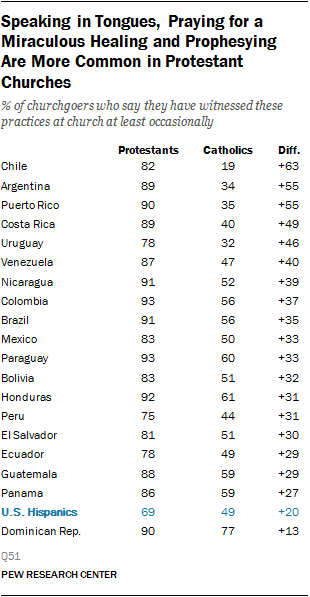 Protestants in Latin America, like Protestants elsewhere, belong to a diverse group of denominations and independent churches. 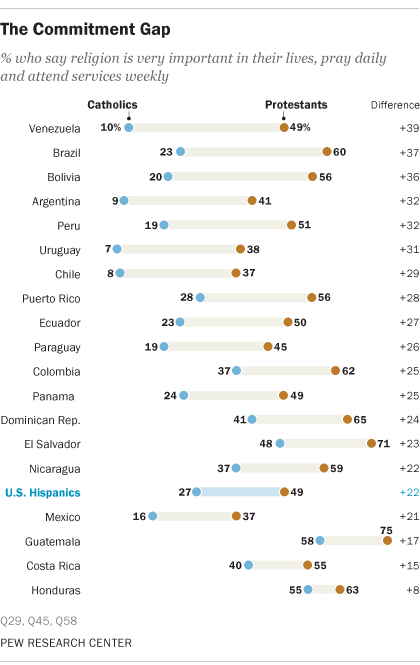 But unlike in the United States, where the labels “born again” and “evangelical” set certain Protestants apart, in Latin America “Protestant” and “evangelical” often are used interchangeably. 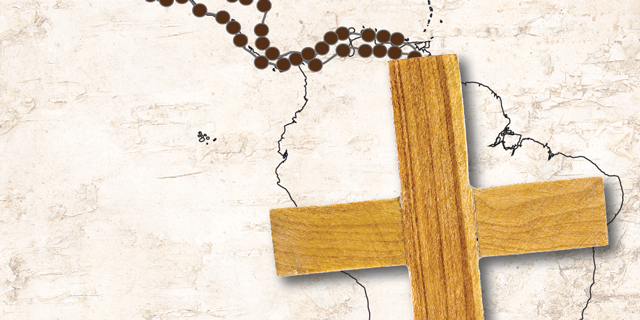 “Evangélicos” – as Protestants in the region often are called – include many Christians who belong to Pentecostal churches. While practices vary, Pentecostal worship services often involve experiences that believers consider “gifts of the Holy Spirit,” such as divine healing, speaking in tongues and receiving direct revelations from God. 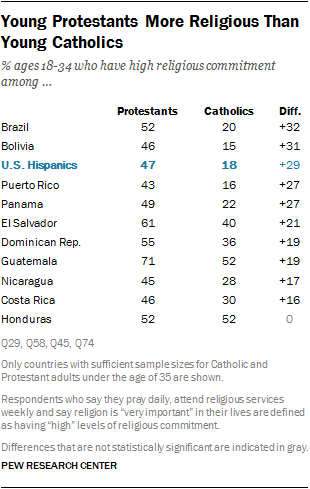 Across all 18 countries and Puerto Rico, a median of nearly two-thirds of Protestants (65%) identify as Pentecostal Christians, either because they belong to a Pentecostal denomination (median of 47%) or because they personally identify as Pentecostal regardless of their denomination (median of 52%). 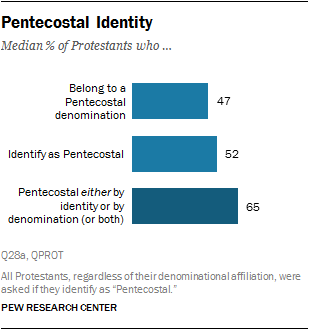 Some Protestants identify as Pentecostal in both ways. 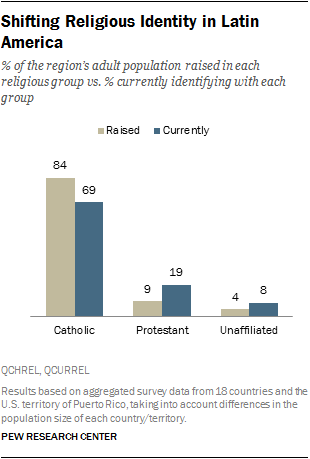 The survey also asked churchgoing respondents how often they see fellow worshipers speaking in tongues, praying for a miraculous healing or “prophesying” (spontaneously uttering a message or “word of knowledge” believed to come from the Holy Spirit). 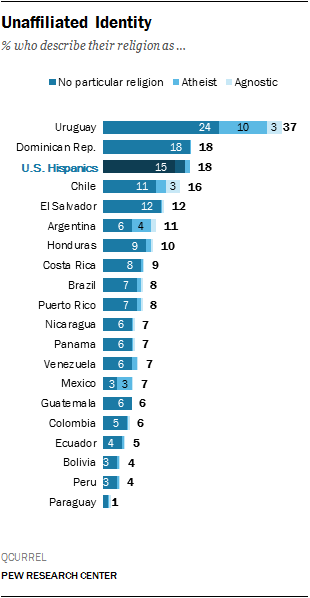 Most Latin American Protestants say that speaking in tongues, praying for a miraculous healing and prophesying are frequent occurrences in their religious services. 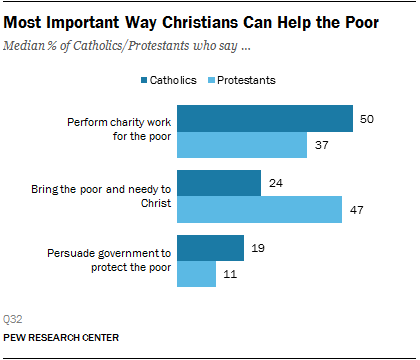 Fewer Catholics say that such behaviors are on display during Catholic worship services, and majorities of Catholics in Uruguay (63%), Argentina (61%) and Puerto Rico (60%) report that speaking in tongues, praying for a miraculous healing and prophesying are never part of their worship practices. 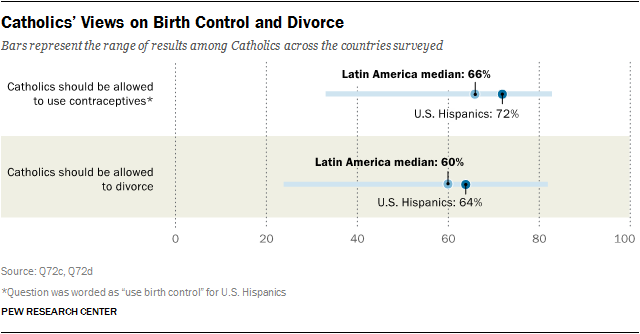 Historical estimates for individual Latin American countries underscore that the shift away from Catholicism is a relatively recent phenomenon in most locations. 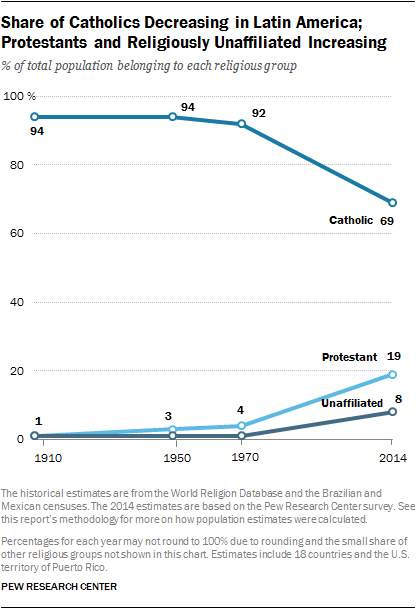 The estimates reveal only two places that experienced double-digit declines in Catholic identity between 1910 and 1970: Chile (a decline of 20 percentage points) and Puerto Rico (a 13-point decline). 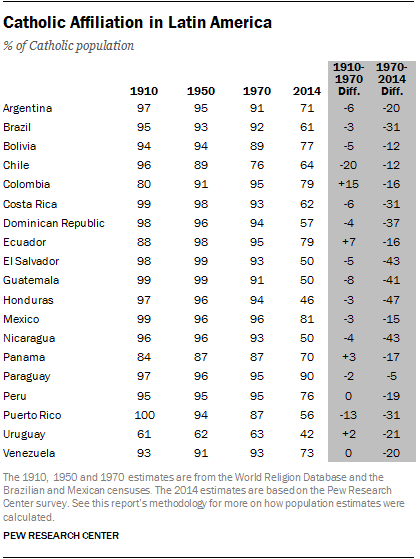 In Colombia, the percentage of people who identified as Catholic actually increased by 15 percentage points between 1910 and 1970.